In 2011, the Pistorio Foundation reached an important milestone with over 2,000 underprivileged children benefitting from access to education, basic nutrition and primary health care. Increasingly, our growth and focus has been on our Chiang Rai Village Project. In Chiang Rai, Thailand, our support extends to sixteen minority hill-tribe villages and moving forwards we intend to build capacity for this project and continue strengthening our existing programs while maintaining controlled growth. The Pistorio Foundation seeks to improve the living conditions of underprivileged children starting with education, through holistic scholarship programs and by building and improving school and village infrastructure. We make sure that through the scholarship programs (1) every child receives access to education, as well as to basic nutrition and primary health care, since to succeed in school a child must also be well nourished and in good health; and (2) every child receives support from Primary School up to Professional School, as having only a Secondary School degree without a Professional School degree may often not be sufficient for children from marginalized groups to be subtracted from the risks of forced labor, forced marriage and other forms of exploitation. Every year now, tens of our students are completing their Professional School degrees and finding jobs. Many of them are subsequently supporting their younger siblings in school and sending money back to their parents, and some have chosen to return to their home villages to help further develop their village. In Thailand, we have developed a Village Model Approach: we bring educational opportunities to children of the village by providing transportation to the nearest public school or by building or improving school infrastructure in the village; we invest in school canteens and sanitation facilities; we build water supply systems for the village and provide villagers with primary health care screening through our Mobile Clinic Program; we encourage agricultural and income generation programs of the villagers. In this way, village communities are strengthened with less chance of families to leave their villages for urban centers. In Morocco, following the successful launch of the Back to School Program in Azrou in 2010, we have now begun the construction project of a new building that will host the 40 children enrolled in our program and who are currently following the program at our local partner’s premises. Unfortunately, one of the setbacks of 2011 has been that the Foundation has had to discontinue its support to the School Project in Lithang, Tibet (China) as the local Chinese Government has requested to take upon itself the funding of the project. The Foundation had built a Dormitory at a Primary School campus in 2006 in Lithang, and for six years has been supporting the primary school education of 80 underprivileged nomad family children. The school and dormitory will be run as of 2012 by the Chinese local government as well as the scholarship program for primary school children. The Foundation continues to operate as a volunteer based organization with no paid staff. The Foundation works in close long term partnerships with selected local NGOs and focuses on selected regions and communities for lasting impact. Country Managers work with partner organizations to select, define, develop, and implement projects. Country Managers and dedicated volunteers monitor the progress of scholarship programs and infrastructure projects, meeting regularly with relevant stakeholders including school staff, village representatives, direct beneficiaries and their families, and government representatives. Volunteer auditors and partner NGOs provide regular feedback and track relevant indicators on the results of the scholarship programs and on the quality of the education received. 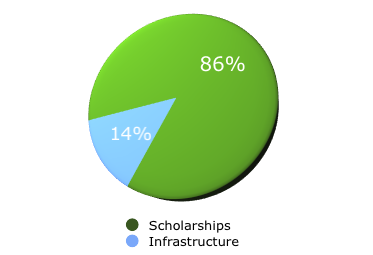 This operating model allows us to maintain the Foundation’s overhead cost at close to zero, maximizing cost efficiency and ensuring that 100% of private donations received are devolved entirely to scholarship and infrastructure programs that directly benefit children in need. Our fundraising activities are also run by volunteers. In 2011, the Foundation has benefitted from three events in Singapore. In addition volunteers have organized in kind donations drives of clothes, books, and toys that have been shipped to Thailand for the hill-tribe communities and schools. More than twenty volunteers that make up our Singapore Chapter Team have worked tirelessly throughout the year to further the Foundation’s cause. This year, our President and Founder has been honored with the privilege of receiving the IEEE Robert N. Noyce Medal Award, as a lifetime achievement for his time as CEO of STMicroelectronics (1980-2005), namely “for contributions to, and leadership in, the technology, business and environmental development of the global semiconductor and electronics industry.” The award came with a US$ 20,000 donation which was devolved to CESVI for the ongoing hunger and humanitarian crisis in the Horn of Africa. CESVI operates the largest refugee camp in the world, in Daadab, delivering medical support and material assistance to women and children in the camp. Let us not forget that although collectively as human beings we may not be responsible for the some of the most pressing problems afflicting the world today – poverty and unequal distribution of wealth, pollution, and over population – we do believe that we are all responsible for not doing enough to solve these problems. Let us not hesitate to give our best effort today to bring change and hope to the lives of the world’s children for the world’s tomorrow. “On the way to school, on the way to life”. 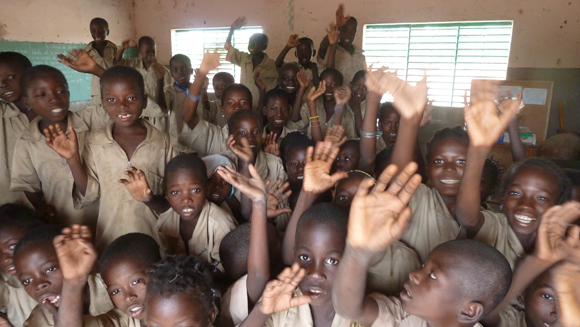 The Foundation supports the education of 100 underprivileged children’s in the rural region of Boulkiemdé, Burkina Faso. The children are from five neighboring villages and most of the students attend the Nibagdo primary school which the Pistorio Foundation expanded in 2006 to accommodate more children. As there were not prospects for most of these children to attend Secondary School, the Foundation built a secondary school in the nearby village of Sogpelcé which opened in September 2010. The Secondary School serves a population 13 villages. In 2011, 9 of the primary school students that we have been supporting since Primary School are now enrolled in the Secondary School, which now holds 346 students. The Scholarship includes one or two uniforms, meals in school, medical check-ups, vitamins, didactical material for teachers, maintenance of school infrastructures, sports equipment, and teacher workshops. In 2010/2011, additional teacher training in the course of the year has helped improve the pass rate compared to the previous year. In addition, this year 50 parents of beneficiaries have received basic accounting and budget planning training. Both the primary and secondary school provide above average results in comparison to national standards, also owing to the presence of canteen and kitchen, to access to medical check-ups, basic health care, and hygiene instruction, to improved infrastructures, and to teacher training workshops. In Burkina, the rate of enrollment in primary school is only 63.2%, and in secondary school it is as low as 17.5% (UNESCO), with important gaps between urban and rural areas, making it one of the weakest countries in west Africa in terms of access to education. 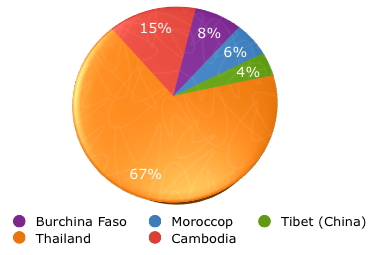 According to the World Bank, Burkina Faso is among the top 10 countries in the world with the lowest primary and secondary school enrollment rates, and its literacy rate is at a low 29%. « I am currently attending CM2, the last year of primary school in Nibagdo. The scholarship support has changed my life and my family’s life. At school, I am able to have my own notebooks, pencils and pens, a uniform, shoes, and food. My parents are happy with me and encourage me to study hard and do well in school. I am very fortunate to have a chance to attend school, as many of my peers in other villages are out of school. I am lucky I know how to read and write, unlike those who cannot go to school. In the future, I want to be a school teacher ». Nearly 80% of the students that the Pistorio Foundation has been supporting at the Lithang School campus will complete their primary school education in 2012. Those who have had to repeat a year will complete their primary school education in 2013. The project began in 2006 with the construction of a school dormitory for underprivileged children of Tibetan nomad families in Lithang. Subsequently, 80 children enrolled in the scholarship program and were able to attend school at the Lithang campus and benefit from a course curriculum that also offered Tibetan language, lessons in Tibetan culture including art, dance and music, in addition to the core Chinese curriculum. The students have consistently performed better than the national average on standard examinations and nationwide competitions. The students supported by the Foundation have been housed at the Foundation’s dormitory on the school campus. 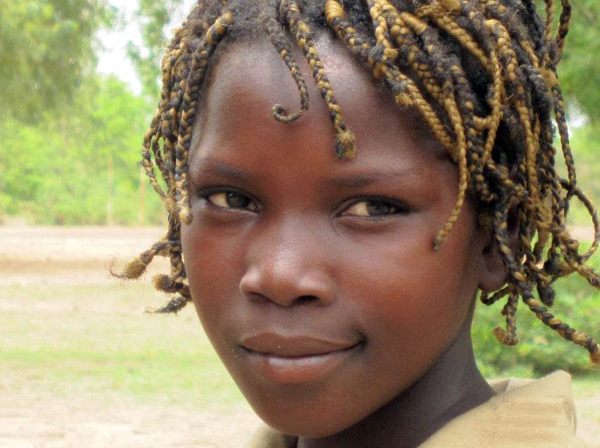 Scholarships provided for school and boarding fees, teacher salaries, three meals per day, and primary health care. In addition to the intellectual growth of the children, the positive results of the Project have been improved health of children who are less prone to falling ill and are better nourished than their peers who have not had access to school. Another positive outcome of the project is the educational value to the local community: parents and nomad families have understood and learned to appreciate the importance of education for their children. The Foundation has had to end its support of the Project upon the Chinese government’s request. The Chinese government will be funding the project hereafter. To date, the children completing the Lithang Primary School have been able to continue to secondary school in Lithang. The living conditions of the nomad population of over 700,000 people has become more critical in recent years and education is a crucial factor to break these families’ cycle of poverty and empower the new generation. Still today there are over 1 million primary school aged children in Thailand who are out of school and nearly 1 million children who lack birth registration documents (Unicef). Poverty, marginalization, and language barriers place these children and their communities at high risk of human trafficking, which is still a tragic reality in Thailand. Building strong and self sustainable communities in villages and providing every child with education all the way to professional school is, we believe, the best form of prevention of human trafficking. Even completion of only secondary school education is not a guarantee that a child will be safe from the risks of trafficking – only the opportunity provided by a Professional School degree title or higher education can allow them to access fairly paid professions and escape risks of exploitation. The Pistorio Foundation has been able to support 571 more students in Thailand this year reaching 1886 underprivileged children. Most children are from minority hill-tribe villages in Chiang Rai, although we have now started supporting one village from the Chiang Mai province as well from the Ratchaburi province. The number of children we support in each village also increases every year as new families settle in the community and former students that were living in faraway towns to obtain an education have returned to their home village to continue their schooling with the Foundation’s scholarship program. Children of the village from preschool to professional school are given scholarships so that they may attend school free of charge. At school, we make sure they receive one nutritious meal a day and yearly medical check-ups. In each village, we upgrade existing preschools, making sure they have sanitation facilities, kitchen and canteen, so that the facilities are adequate and the parents of children can spend more time on their work without needing to pick up their children at lunchtime. In some cases, we also supplement teaching staff if the government does provide enough teachers for the number of children enrolled. We provide transportation to school to the nearest village, and if the road conditions and/or distances don’t allow this, in very remote villages, we have built Primary Schools, complete of Teacher Accomodations, Canteen, Kitchen, Library and Computer Room. In these campuses we have also built student dormitories for children of neighboring villages. The Schools are run by the government, and the teachers are provided by the government. The Foundation volunteers and local partner staff regularly visit villages and schools and meets with stakeholders to assess the progress of the children in school. As early as in Preschool, underprivileged minority children are able to learn basic Thai to prepare them for the demanding Primary School curriculum, as at home they only speak the tribal language and their parents don’t know Thai language. Preschool and Kindergarten attendance is linked with increased success in children’s future academic career. Building strong communities in villages, by providing school infrastructures, improved sanitation through clean drinking water and sanitation facilities in schools, and promoting programs in agriculture and self-sustainable income generating activities, will also help prevent the migration of children or families to large town centers, and thus help prevent trafficking and exploitation. During their schooling, hill-tribe children also receive classes in their own tribal culture, language and history. This is to enforce their knowledge and appreciation of their culture and help preserve it. Students who finish professional school sometimes chose to return to their villages, to help the local community. Those who do not return maintain close ties, visiting regularly their families and sending a portion of their incomes to their parents and younger siblings. Professional School degrees offered include Nursing, Tourism and Hospitality, Mechanics, Accounting, Mechanics, Agriculture, Information Technology, Electronics. The Foundation renovated the preschool and built sanitation facilities, canteen and kitchen, playground (total budget 10,395 CHF). 48 Preschool children benefitted from the renovation of the preschool. The preschool serves a village of a population of nearly 1,000 people. The parents of children have contributed work for the renovation. Huay Kuk is a Hmong hill-tribe village with a population of 427 people and 76 households. 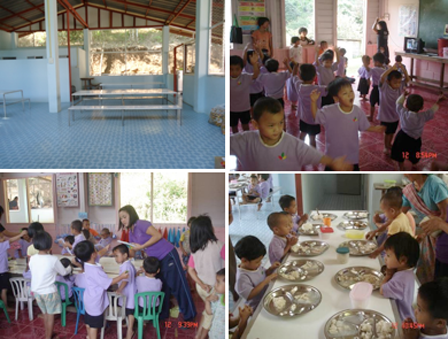 The village is on the Laos border, and the school built in 2009 now holds 145 students. 29 students from two neighbouring villages a few kilometres away from Huay Kuk are housed at the school campus dormitory newly built by the Foundation during the school week and they return to their homes on weekends. Through this program the Pistorio Foundation is able to provide at least once a year primary health care to villagers who do not have citizenship and access to health care in the villages the Foundation supports. 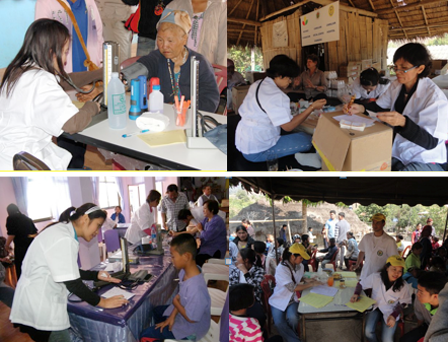 The Program, in partnership with the Camillian Hospital in Bangkok, brings doctors and nurses to villages and gives medical check ups to villagers of all ages. In addition, basic medication against common ailments such as lice and worms are donated. The teams of doctors and nurses check for skin, eye, and dental health as well as blood pressure. Leaflets on hygiene, nutrition, and preventive measures against common ailments are also distributed to families. The Pistorio Foundation continued to extend its support to underprivileged children of the Center of Pour Un Sourire d’Enfant (PSE). This year, 8 students which the Foundation has been supporting for a number of years have successfully completed their Professional School degree. Of the 114 children supported, 32 are in Primary School, 34 are in Secondary School, and 57 are in Professional School Programs. These children were formerly working on the municipal dump as scavengers to find plastic to sell to recycling companies. At PSE, they have been able to access education, nutrition and health care and a safe environment to grow in. Families of these children receive an allowance in rice to compensate for the loss of income represented by the children’s enrollment in school and to encourage parents to allow their children to attend. At the Center, children from the slums are able to wash, clean their clothes, receive two nutritious meals and two snacks per day, and primary health care (yearly medical visit for students and their families, free vaccinations and medications, and specialty doctor consultations). Teachers in public schools in Cambodia are severely underpaid which perpetuates a system whereby teachers demand a daily payment from students and poor students who are unable to pay are penalized and given poor grades, which further aggravates their chances of continuing school and makes their parents decide to take them out of school. At PSE schools, teachers are given a better salary so that this does not happen, and the scholarship also provides for Teacher’s compensations. Although the schools conform to the national school system, they provide catching- up learning opportunities to students in order for them to catch up 2 grades in one year. This is because some children have been out of school for several years. In many instances, the government has praised the work of PSE for the quality of its school and its high pass rate. The government has in fact invited PSE to be part of a strategic committee to plan public vocational centres in Cambodia. Some of the students who have graduated are now supporting the scholarships of their sibling in school and have formed an Alumni Association to encourage current students to continue their studies and to inform them on their post school successes. Children follow a very comprehensive and well balanced curriculum that includes not only French and Khmer but also English, as well as IT, Hygiene classes, Human Rights education, in addition to the standard public program. Student’s results at examinations are consistently higher than the national average. The families of both girls are very happy that they are students at PSE. The parents of both these girls work as scavengers and live in shacks along the dumpsite. Srey’s father’s health is in precarious conditions as his eyes are failing and her mother is weak. Srey’s sister of 24 is also on scholarship and completing her vocational training diploma. Tala’s mother is very proud of her daughter and the effort she is making to give her family a better life. Tala’s mother is also raising two grandchildren who are in school. She is very keen for all of her children to have an education and to improve their situation. The Pistorio Foundation offers children who have dropped out of school the opportunity to attend National Non Formal Education, which allows students to catch up in one year two years of their education. Many children at the center have been out of school for years and are very much behind academically. Some of them have learned to read and write at the center despite they are already 8 years old or above. The children’s ages vary from 8 to 16 and they come from the lowest income families in the impoverished communities of Azrou. Many have left school due to the violence of teachers in school and others have had to beg or work on streets to help bring some income home to their families. All of the students are extremely motivated and grateful to be part of this program. In fact, the environment is such a change from their former schools that they are reluctant to re-enroll in the public school system. In 2011, one child aged 13 was successfully enrolled back in the public school system, and one student was admitted at a Professional School. Older children at the Center can chose to follow a two to three year Vocational Training Program that will allow them to find employment subsequently. The Center offers Vocational Traning programs in Hairdressing, Tailoring, and Sculpture. At the Center, caring, qualified and skilled teachers give individualized attention to these students, and strong friendships have formed among the students. The curriculum includes lessons in French, Arab, IT, and Maths. Excursions to cultural sites and sports days are organized, for most a novelty in their lives. The older students have also formed a musical band that is called to play at events such as weddings and allows them to make a small income from this. These children have been taken away from life on the streets and faith in themselves and their future is being restored. To give adequate facilities to these students, who currently attend classes at the structures of our local NGO Partner Azrou Center for Community Development, the Foundation is funding along with other local investors the construction of a new three storey building that will include two classrooms, one workshop room, one library and one computer room, and one canteen and kitchen for the students. The building is expected to be completed by 2012. The children’s scholarships, in addition to school texts, supplies, and teacher’s salaries, also include medical check-ups and primary health care and one nutritious meal per day in school. The Project aims at improving the enrollment rate in the extremely poor neighborhoods of the city of Azrou, Morocco. According to the World Bank, half of Morocco’s children aged 15 to 29 are out of school or do not work. A large number of school-aged children and adolescents are excluded from the system, with high repetition and dropout rates. Secondary school enrolment rate was only 51 % in 2011, with big disparities between urban and rural settings. Our most heartfelt gratitude goes to our team of selfless and dedicated volunteers who employ passion and creativity to fundraise and enable underprivileged children to access life changing educational opportunities. The Chapter has organized and run two successful events raising the equivalent of 43,396 CHF. The events included a children’s theater production at the Singpaore Repertory Theater and a Springtime Lunch hosted by OSO Ristorante. For the Ugly Duckling performance we would like to acknowledge The Little Company and Singapore Repertory Theatre, Fantastic Holidays, TFL Training Consultants, Skygym, Seb’s Bistro, Georgie Ohlsson Jewelry, Sophie and Friends, and Nestlé. For the Springtime Lunch we would like to extend our thanks to Diego Chiarini and Stéphane Colleoni of OSO Ristorante, Harper’s Bazaar, Passion, Lotus on Water, Small Luxury Hotels of the World, Asiatique Collections, Bruno Gallery, Passion, Caran d’Ache, Gaia restaurant, Bluebellgroup, Emilio Pucci, Furla,Carolyn Strover and Havoc, The Frame Society, Georgie Ohlsson, Kaffe & Te, Nestlé, Moschino Cheap and Chic, Carrot Banana Peach, Crabtree & Evelyn, Sportsac, and The AVL Sound. We would like to extend our gratitude also to Yang Loh of Autium Jewellery who sponsored and organized a glamorous in house event where Pistorio Foundation was beneficiary of a live auction. Autium also pledged 5% of its sales to the Pistorio Foundation, an important and exemplary commitment of a company to the important cause of improving the living conditions of underprivileged children in the world. Thank you to Intel staff in Singapore for their creative clothing, books and toy drive that successfully collected 250 kg of items. We would like to express our deepest appreciation to Peggy Khoo, Ee Lin Tan, and Kristin Lim and their generous colleagues. Thank you also to DHL who sponsored the transportation of the boxes to Thailand. Thank you also to the Huang Yao Foundation for their generous donation of dozens of wonderful children’s books featuring Huang Yao’s stunning masterpieces. Thanks to our volunteers’ sale of these books, the Pistorio Foundation was able to raise over 700 CHF. 500 pairs of shoes generously donated by Bata and Bata Children’s Foundation were distributed to underprivileged children of three villages in Chiang Rai. Our deepest appreciation goes to Bata and Bata Children’s Foundation for the generous contribution.